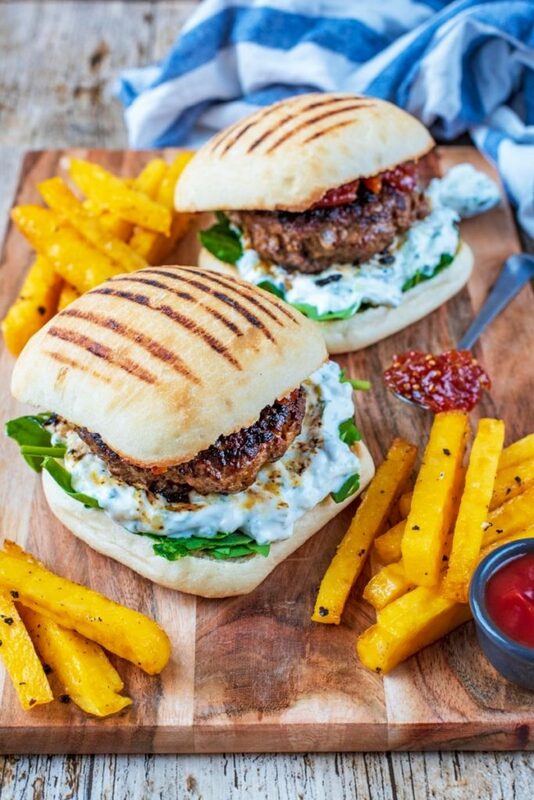 Lamb Burgers are a great alternative to beef, as they are really moist and have so much flavour. 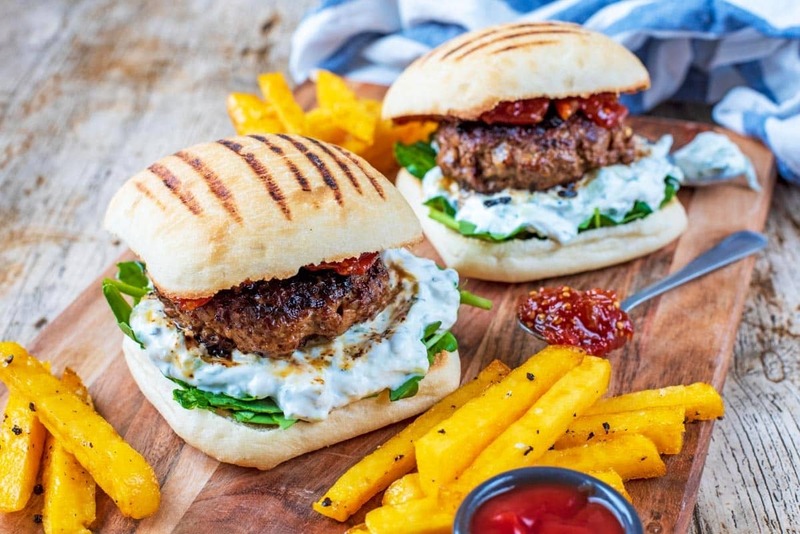 These Spiced Lamb Burgers are absolutely delicious and something a bit special topped with creamy Tzatziki and a sticky Chilli Jam. Definitely a burger for when you want to impress your dinner guests, but not go to too much effort. Lamb mince makes such great burgers, not just because of the fat content, but because it has so much flavour a little bit goes a long way. The lamb flavour also goes really well with a variety of spices whether you are going for an Italian burger, Greek, Mexican or a spicy cumin version like we have. 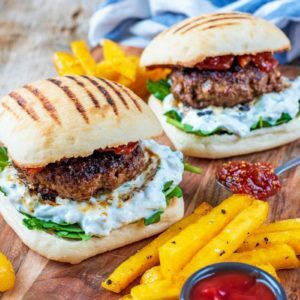 These spiced lamb burgers couldn’t be any easier – you just put the mince in to a big bowl with all the other ingredients, mix well and then form in to patties ready for cooking. You could eat them just like that, but where is the fun in that? Burgers are all about the toppings! Some kind of creamy sauce is a must when it comes to burgers I think and our homemade tzatziki goes perfectly on them. You have the creaminess of the Greek yoghurt, the freshness of the lemon and mint (we all know how well lamb and mint go together) and some added crunch from the cucumber (or courgette as an alternative). Never satisfied with just one topping, we took these burgers to the next level by making some tomato chilli jam to spread of the buns. 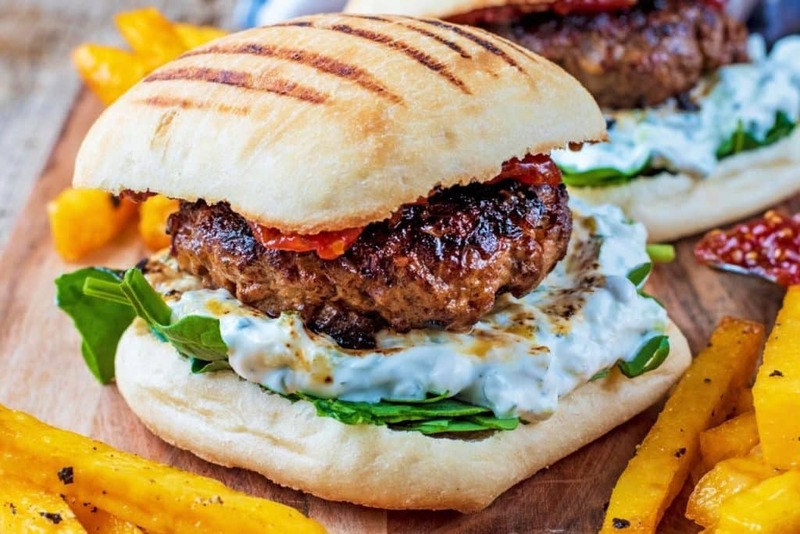 It really amps up the flavour of these burgers without being overly spicy as the tzatziki cools it down. When we photographed these it wasn’t exactly BBQ whether, so we fried them until they were crispy on the outside and cooked but still moist on the inside. You could make these healthier by putting them until the grill for 5 minutes each side. But, in the summer time what we love to do is cook these on the BBQ. Because of the fat content of the lamb, these cook really well on a BBQ grill and they are always the first to be eaten out of the burgers we serve up. You would cook them for about 5 minutes each side. It’s always best to have a meat thermometer to make sure everything is fully cooked. Can These Be Made in Advance and Freeze Then? 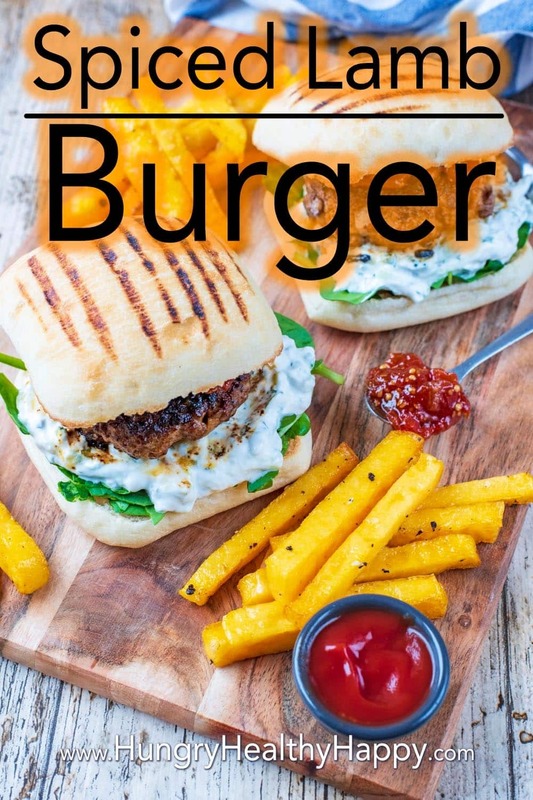 You can form these burgers in to patties and then put them in the fridge for a couple of hours until you are ready to cook them. If you want to freeze them, put them on a tray and then in the freezer. Once fully frozen, you can stack them with baking paper in between each and then put them in a freezer bag and back in the freezer. Make sure they are fully defrosted before cooking. I mean, these burgers are pretty epic and not exactly low in calories. But, if you were wanting a blow out burger meal (that is still probably healthier and lower in calories than ordering takeaway), then we served them with our Garlic Baked Polenta Fries. You could also serve them with Baked Sweet Potato Fries or even our Broccoli Slaw for a veggie boost. One: Cut the tomatoes into chunks and put them into a pan. Two: Add the rest of the ingredients and bring to a simmer. Three: Continue cooking the mixture until it starts to reach a thick jam consistency. At this point reduce the heat and watch the mixture closely to avoid it catching on the bottom of the pan. If you have a probe thermometer, wait until the jam has reached a temperature of 105C. It will take around 10 minutes. Four: Once cooked, set aside. One: Put all the burger ingredients into a bowl and use your hands to mix well. Two: Mould the mixture into two burgers of a similar size and leave in the fridge until required. Three: To cook the burgers, fry them in the olive oil, leaving them just moist inside – the cooked internal temperature should be 70C. This will be about 5-7 minutes each side. Four: Make the tzatziki by following the instructions here. Six: To serve, build your burger with salad leaves, a decent dollop of tzatziki, the burger then top with a tablespoon of the jam. You can either fry these burgers, cook them under the grill or cook them on the BBQ. These burgers are quite indulgent, so either eat them by themselves or you could serve them with fries or slaw if you wanted something extra. Our homemade tzatziki and tomato chilli jam go perfectly on this burger. You can freeze these burgers on a tray and then stack them in a freezer bag and keep in the freezer. Do you want to be kept up to date on more delicious posts like this Please subscribe to the blog mailing list (it takes 30 seconds). 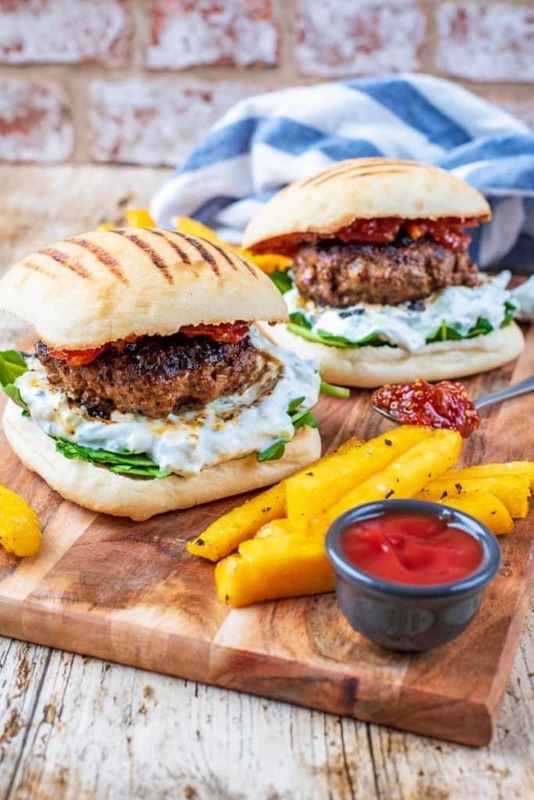 Lamb Burgers are a great alternative to beef and this Spiced Lamb Burger is absolutely delicious. Topped with creamy Tzatziki and a sticky Chilli Jam. 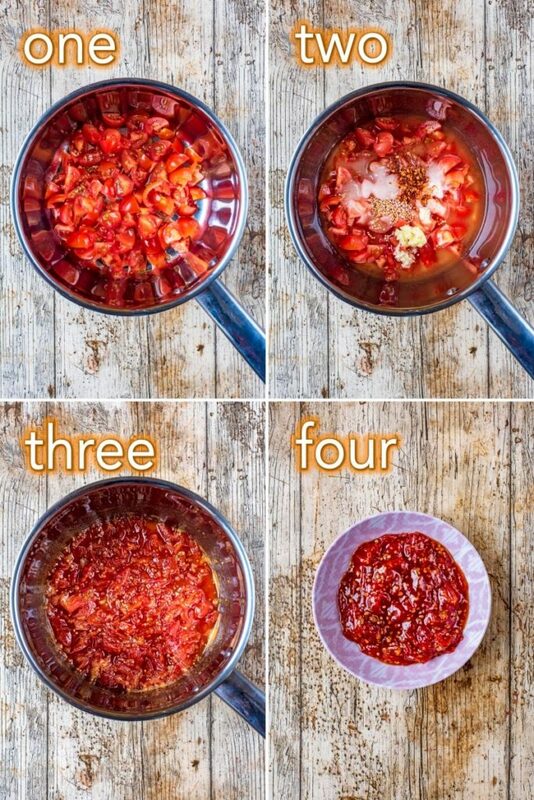 Cut the tomatoes into chunks and put them into a pan. Continue cooking the mixture until it starts to reach a thick jam consistency. At this point reduce the heat and watch the mixture closely to avoid it catching on the bottom of the pan. If you have a probe thermometer, wait until the jam has reached a temperature of 105C. It will take around 10 minutes. Put all the burger ingredients into a bowl and use your hands to mix well. Mould the mixture into two burgers of a similar size and leave in the fridge until required. Make the tzatziki by following the instructions here. To cook the burgers, fry them in the olive oil, leaving them just moist inside – the cooked internal temperature should be 70C. This will be about 5-7 minutes each side. To serve, build your burger with salad leaves, a decent dollop of tzatziki, the burger then top with a tablespoon of the jam. If you are unsure of the chilli jam's ‘jaminess’, put a little of the mix on a cold plate and chill in the fridge. It will set after a few minutes and you will be able to judge if the rest is ready to take off the heat. I love that you have treat days too. This will be my treat meal next week. Those dumbasses on facebook can get lost! I love lamb. It is definitely the best meat. I never thought about making lamb burgers though. Great idea! These look so good. I love burgers and healthy too!